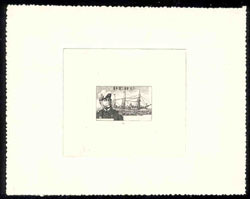 2296 EA PERU (1957) Frigate "La Victoreuse"*. Admiral Dupetit-Thouars*. Scott No C129. Yvert No PA123. Stage Die Proof in black. Some of the engraving lines including the inscriptions and face value are missing. Very rare! 15954 EA PERU (1958) Lady in costume*. Beautifully hand-colored die proof. Peruvian Exhibition in Paris. Scott No C145, Yvert No PA139. Unique! 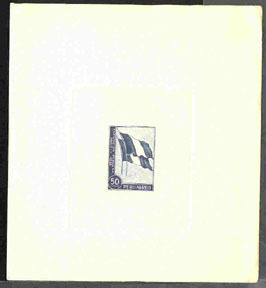 16078 EA PERU (1958a) Flags of France and Peru*. 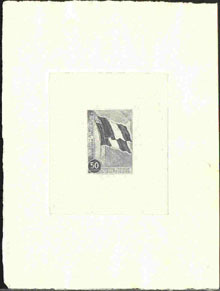 Die proof in black. Peruvian exhibition in Paris. Scott No C144, Yvert No PA138. Rare! 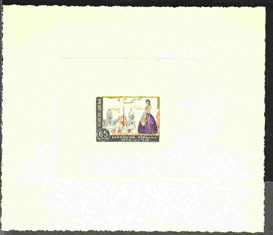 16079 EA PERU (1958b) Horseback rider*. 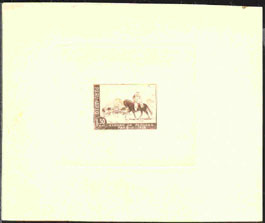 Die proof in brown. Peruvian exhibition in Paris. Scott No C146, Yvert No PA140. Rare! 16173 EA PERU (1958) Peruvian & French flags*. Die proof in dark blue. Peruvian Exhibition in Paris. Scott No C144, Yvert No PA138. Also available in brown (3 shades) and black. Scarce!